WASHINGTON, D.C. -- U.S. investors are the most optimistic they have been in the past seven years, as the economy slowly continues to improve. 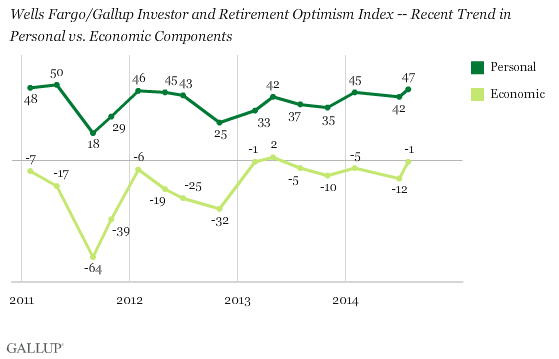 The Wells Fargo/Gallup Investor and Retirement Optimism Index rose to +46 in August, a jump of 17 points from July. The last time the index was this far into positive territory was the fall of 2007, as the U.S. hovered at the edge of the recession. The index has approached this level several times only to quickly retreat, thus producing what looks more like an inconsistent recovery in confidence than a true upward trend. The index is still far below its peak of +178 measured in January 2000, a time when the U.S. was approaching the end of nearly a decade of prosperity and economic growth. Steady growth in optimism among nonretirees has fueled the current spike. The Wells Fargo/Gallup Investor and Retirement Optimism Index is a measure of broad economic and financial optimism among U.S. investors with $10,000 or more in any combination of stocks, bonds, mutual funds, self-directed IRAs, and 401(k) retirement accounts. The index has been conducted quarterly since 2011 and, prior to that, was conducted quarterly from October 1996 through December 1998, and monthly from February 1999 to October 2009. The current results are based on interviews conducted Aug. 15-24 with 1,011 investors, including 374 retirees and 631 nonretirees. The index consists of a personal component, which measures investors' beliefs that they will be able to maintain or improve their income over the next year, and an economic component, which assesses investors' broad views of the American economy and its health. These two dimensions have followed similar paths since 2011, although investors' views about their personal situation have been consistently much more positive than their views about the economy overall. There is somewhat of a disparity between retired and nonretired investors' optimism. The gains in the index this year have come more from rising optimism among the nonretired than the retired. This may be attributable to steady gains in job creation and GDP growth in 2014. 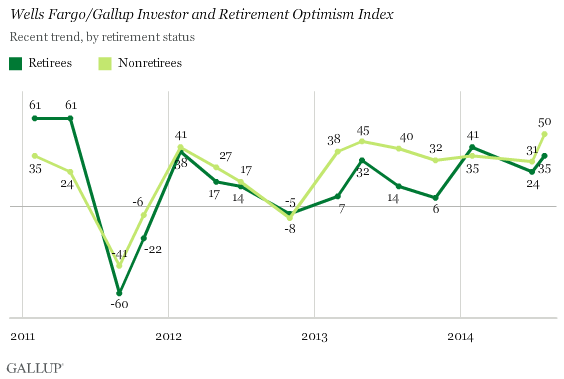 While optimism among retirees surged earlier in the year, it has cooled somewhat since. The previous gains may have been related to recovering stability after the partial government shutdown last fall, and the cooling may have resulted from a relatively flat stock market throughout 2014, among other possibilities. While investors' optimism has risen to its highest level in seven years, the gains in 2014 should still be considered modest. 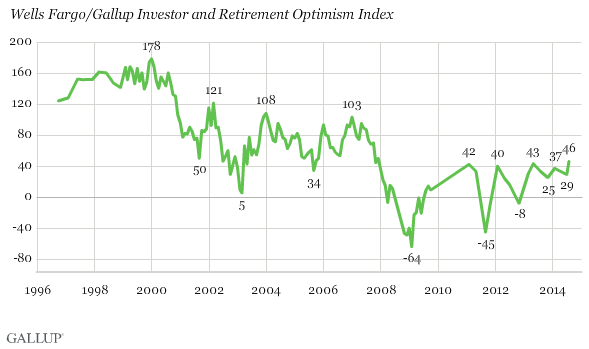 Investor optimism is a fraction of what it was in the early 2000s and is less than half of what it was in January 2007. In addition, optimism has undergone significant ups and downs in recent years rather than enjoying a steady upward curve. Yet, the overall movement is upward, mostly spurred by nonretirees, and this is generally in line with upward trends in the U.S. economy in 2014. It remains to be seen whether or when the index will recapture its early 2000s glory, as the economy continues to find its footing. Results for the Wells Fargo/Gallup Investor and Retirement Optimism Index survey are based on questions asked Aug. 15-24, 2014, on the Gallup Daily tracking survey, of a random sample of 1,011 U.S. adults having investable assets of $10,000 or more. For results based on the entire sample of investors, the margin of sampling error is ±3 percentage points at the 95% confidence level. Gallup's U.S. Economic Confidence Index ticked down two points to a current reading of -18 for the week ending Sept. 21. The index continues to follow the relatively flat trend it has been on throughout 2014. Of five major common financial decisions, U.S. investors are the most likely to seek professional advice when creating a financial plan, followed by college planning. Far fewer seek any kind of advice when buying a car or house. U.S. investors -- adults with $10,000 or more in investments -- are more likely to have a dedicated financial adviser (44%) than to use a financial website for getting advice on investing or planning for their retirement (20%).